"When he was young, we occasionally brushed Shinobi’s teeth. It wasn’t easy but we got it done. I’d heard of dental cleanings but never understood its importance until later. I thought it was for older dogs and seemed extreme for my young dog that had beautiful white teeth at that time. Instead, I brushed and offered a variety of chew toys to clean his teeth. Meanwhile, Shinobi’s behavioral issues were progressively worsening. We consulted with 4 different [trainers] regarding his anxiety and fear aggression… It was difficult, but we kept Shinobi and our children separate. As much as they wanted to play with him, I knew it was unsafe… We did months of training with little success. He’d be sweet and playful one moment then quickly escalate, attacking the next. Tooth brushing became nearly impossible. He’d bite my hands, wrists, and cut up my forearms. I finally decided it was enough and replaced brushing with chew toys alone. Things seemed ok. His breath didn’t smell. His teeth looked fine. … Even though he was very spry for an older dog and never complained of hurting, he must have lost interest in his toys because his teeth were painful…. I consulted with a different vet who referred us to the Animal Dental Clinic. Now, at 11½ years old, it is a life changing experience for Shinobi. Dr. Battig and Dr. Block were very knowledgeable in dental health. They skillfully gained rapport with Shinobi who is apprehensive in unfamiliar settings, especially having his mouth touched…. Now toothless Shinobi is doing fabulous! … He enjoys spending time with our 2 year old daughter and 4 year old son. That is something I NEVER imagined would be possible for Shinobi! It was a terrible lesson learned but ends well, as his quality of life improved tremendously. Thank you so much Animal Dental Clinic NW for giving Shinobi an opportunity to live his elder years in health, comfort, and bliss once again. "Our family member, Revy, needed major dental attention and I was extremely apprehensive about having such an amount of work done. After extensive research throughout the Portland Metro area I found Dr Jean Battig at the Animal Dental Clinic. Our consultation appointment was thorough and nonjudgmental even though Revy's teeth were in such bad shape. We made an appointment to have the work done. I could not be happier with the results. The level of care and attention by Dr Battig and the entire staff actually exceeded my high expectations. Revy is doing great and unbelievably, her breath even smells good. Its such a relief to have Revys mouth healthy again. "As a professional, too, with expertise in my field – I understand and sincerely appreciate the pure knowledge, understanding, beyond expertise and true care by Dr. Battig. Dr. Battig and all of you on staff, offered not only professionalism, but more than above and beyond true devotion towards Cinny – the collaboration between vets with Cinny’s primary vet, Dr. Beswick, Dr. Battig and consultation with oncology – the collective pool of information was truly state-of-the-art, professional sharing and the absolute best I could want for my best gal. Cinny is now absolutely fine from her aggressive tongue tumor, and is now afforded a healthy, full life at her age now of 9 yrs. I cannot recommend this team enough, nor more express my heart-felt gratitude. 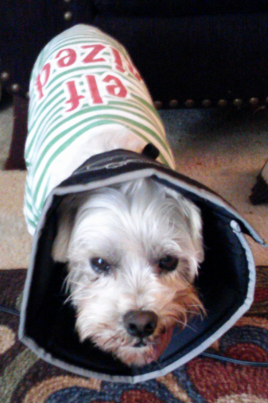 "Peanut has had bad teeth his entire life as the result of a puppyhood illness. When he got down to 4 teeth, I assumed we could forgo dental exams and move forward with soft food and a floppy tongue. Not so! Our regular vet referred us to Dr. Battig when we noticed that Peanut’s gums were really inflamed. It turns out that our beloved ‘Nut needed his last four teeth out AND several residual roots removed. I balked at the cost, but went through with the procedure. I thought Peanut had been slowing down because he was aging (he’ll be 9 soon), but I was mistaken. After Peanut recovered from his procedure, he was renewed-- he’s got more energy and ALL of his former piss and vinegar back. I didn’t realize how poorly he must have felt or how his energy was being affected by his poor dental health, but post-procedure, I was able to see the difference! Dental care is expensive, but what a difference it makes! Thank you Dr. Battig for helping the ‘Nut get his groove back." "Rudy is a our miniature Dachshund that we adopted four years ago from the Oregon Dachshund Rescue. He had a rough go before we got him, with severe abuse and neglect. He also was severely underweight and had failure to thrive when we adopted him. I knew however that he was the one for me, the day I first saw him at the rescue. Initially, Rudy would hide from my husband Mark and I, by going in a bedroom and hiding under the bed covers. We would always go and get him and say "it is family time Rudy." Gradually after about two years, this changed and he freely would interact with our family. Never would Rudy play with toys since we got him, and he has always been a bit lethargic……even with the best vet care. When I would walk him in the park many people would tell me "your dog is too thin, and you need to feed him." Recently Rudy underwent surgery at the Animal Dental Clinic with Dr. Battig to remove almost all of his teeth. I was very worried and sad for him initially. I was also worried he would go back to being underweight since I had worked so hard to get him healthy. Since that time Rudy truly is a different dog! He has more energy and has been very playful with his sister's Annie and Amelia. He is so energetic that our oldest miniature Dachshund Annie has even growled at him a time or two to settle down! That has never happened before. He is also maintaining a healthy weight. The other day we actually saw Rudy run through the house with a stuffed dog toy and throw it in the air! He was trying to engage his youngest sister Amelia to play with him. She did and they both began running through the house playing over the toy! It has brought tears to our eyes to see what a different dog Rudy has become. He chases his tail, kisses a lot………and his breath smells much better! I wish he could have told me how sore his teeth and gums were. We are so glad he is better now! A whole different dog! The care Rudy received was amazing! Dr. Battig had Rudy spend the night with her the first night of his surgery in case he needed any additional pain medication. The entire staff was kind, empathetic and very informative. I also say kudo's to the wonderful anasthesiologist Dr. Shafford. She phoned prior to the surgery to explain everything, and she phoned on three separate occasions after just to check on Rudy! Thank you so much to all of you! Rudy say's thank you for giving him a new life!! !